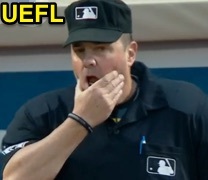 Home Plate Umpire Marty Foster was injured on a foul ball to the facemask and left Monday's Blue Jays-Mets game in New York. With one out and none on in the top of the 3rd inning, Blue Jays batter Josh Donaldson fouled a 98 mph fastball from Mets pitcher Noah Syndergaard onto the chin portion of Foster's traditional-style Wilson mask. After evaluation from Mets training staff, Foster completed the top of the 3rd before subsequently leaving the game. He was replaced by 2B Umpire and crew chief Mike Winters, who with 1B Umpire Mike Muchlinski and 3B Umpire Mark Wegner officiated three-person mechanics for the remainder of the game, a Mets 4-3 walk-off victory in 11 innings.